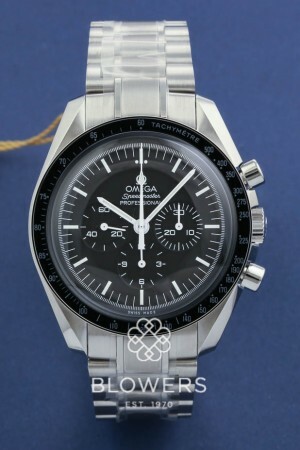 Omega Speedmaster Moonwatch 311.30.42.30.01.005. Steel 42mm case which is water resistant to 50 meters. Hand wound Omega 1861 mechanical movement with a 48 hour power reserve. Hesalite crystal glass. Featuring a Black dial with baton hour markers and an outer Tachymeter bezel. Black sub dials. Steel bracelet with deployment clasp. Comes with 2 additional black textile straps, one with a Velcro fastener and one with a Tang buckle. Pre-Owned Unused. Box and papers dated November 2018. SKU: 4013273. Categories: Omega, Speedmaster.